Why a Career in Law Enforcement? This 4-hour course is designed to instruct personnel in safe driving practices. The student will receive a short educational classroom presentation. 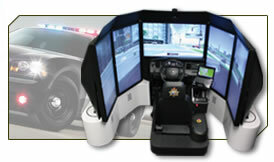 The remaining time will be spent behind the wheel in our state of the art driving simulators. The students will be placed in various emergency and non-emergency driving scenarios where decision making skills will be reviewed and critiqued via video replay. With the kind assistance from The Simon Family Criminal Justice Foundation, our physical fitness track area renovation was completed in June, 2008.